Visibility/Location: Terror on the Square was located in an old 1930s funeral home, in the town square. I found it easily, using my GPS. Signage seemed to be an issue, though. I didn't see any signs posted around town for the event. There was, however, "Terror on the Square" painted on the front of the building, above the entrance of the haunted house. Wait Entertainment: On the night that I attended, there really wasn't much in the way of wait entertainment. Before the event opened, though, the Terror on the Square hearse showed up, getting many cheers from the crowd. Upon its arrival, several characters in hooded cloaks converged on the hearse, to unloaded a coffin. * = Since people move through haunted attractions at different rates, your time will vary. Note: The time shown here represents the actual time spent moving forward through the attraction. Time spent waiting in queue lines, staging areas, intro scenes, rules rooms and when traffic jams cause patrons to come to a halt, has been subtracted. LPR stands for Length/Price Ratio. It represents perceived value of an event, by comparing length vs price of admission. Higher numbers represent more value per dollar. Actual quality and/or entertainment value of an event are not factors in this calculation. Click Here to see how this event compares to others visited this year by the staff of HauntedIllinois.com. Crowd Control: Since Terror on the Square was a guided tour, crowd control was excellent. I never saw or ran into any other groups. Terror on the Square is quite different from your standard haunted attraction. First of all, it was a guided tour. Also, throughout the event they utilized some fantastic illusions. Sometimes these illusions were stand-alone just for the sake of displaying a stunning visually effect, while other times they were used quite effectively to set up a distraction scare. Many of the scenes were fairly small, which fostered a claustrophobic feel within the attraction. Those compact spaces also guaranteed that the entire group would be in one place, so they all could experience the scares. Another thing that I was impressed with is the fact that they let people go through in rather small groups. I was in a group of five and the group before me only had four people. I think it's a much more intimate and enjoyable experience when you have a small group, as opposed to some other attractions that put through 15 people at a time. One scene featured a phenomenal illusion of a flickering ghost girl, who was standing atop a wooden staircase. After flickering on and off several times, she disappeared before our very eyes, then reappeared from a great hiding place, to scare our group. The open casket funeral scene had a casket that was surrounded by folding chairs. In the background, there was a very realistic illusion of a skeleton playing an organ, with three disembodied skills floating overhead. At one point in the tour, my group was led into a freight elevator. The elevator's movement was simulated quite well. As the elevator went down, I could see a realistic-looking brick wall moving past the elevator's window. To add to the effect, a bottomless pit illusion flashed on and off, beneath our feet. Just when I thought it was over, an actor broke in and hijacked the elevator, taking us down even further. Before we were able to leave the scene, there was another surprise scare that I didn't expect. I also liked the detailed graveyard. Behind a wrought iron fence, there were numerous tombstones bathed in green light. To simulate a brewing storm, there was a floodlight that flashed in sync with a booming thunder soundtrack. To exit the scene, we all had to walk through the arched entrance of a stone tomb. In another area, there was a fog filled maze with flashing green strobe lights. The actors in the scene had us going around in circles. It was quite disorienting. The actors throughout the attraction did a great job. Our tour guide gave a very theatrical presentation, introducing every scene. She knew her lines and stayed in character the entire time. Other actors performed pop-out scares. Their timing was excellent and their scares were effective. Overall, Terror on the Square did an amazing job this year. I'm glad I had the opportunity to come back and check it out. The event is very entertaining and with an admission price of only nine dollars, it is also a great value. With its amazing the visual effects, combined with old school distraction scares, this event has something for everyone. Be sure to add this one to your list of haunted house visits this year. 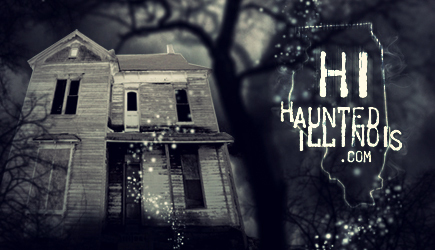 "The Internet's Most Comprehensive & Up-to-date Directory Of Illinois Haunted Attractions"